Hands-on fun for Liberty Harbor residents and their guests! 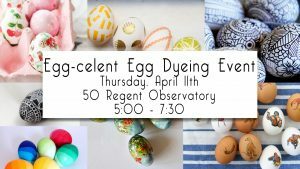 Join us for a fun-filled community event, as we spend an evening dyeing, decorating and decoupaging. Egg designers of all skill levels are welcome! Bring your own boiled (or blown) eggs and we’ll provide the wax resists, dyes and vinegar baths, plus take care of the clean-up. Bring your own boiled or blown eggs (no raw eggs please) and we’ll bring everything else. No rsvp required, but please follow our event on Facebook for any updates. This event is free for residents of Liberty Harbor and their guests.